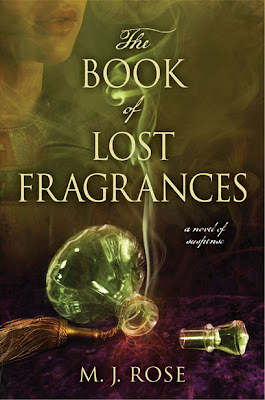 Joya Studio’s Frederick Bouchardy read an advanced copy of The Book of Lost Fragrances, and was inspired to interpret the magical scent in the book. Joya’s Âmes Sœurs hints of Frankincense, Myrrh, Orange Blossom and Jasmine. It’s smoky uncommon finish suggests the past and the future, and lost souls reunited. For every one of the readers who pre-order The Book of Lost Fragrances using the instructions below, the company promoting this will send a sample of Âmes Sœurs. Have placed an order and look forward to what promises to be a good read.